This is another super quick one! 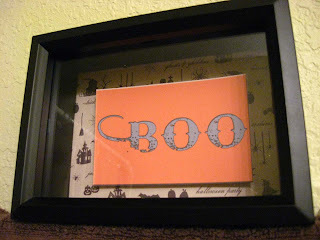 Cut the patterned paper to fit into the back of your shadow box. Print from your photo editing program a spooky phrase. I used the Bleeding Cowboys font and printed it onto orange paper. Stack about 4 squares of foam tape to each other and tape your phrase to the back. You're finished! Try adding a spider to the front, or a few gravestones. You have lots of space to work with, so make sure you use things with different depths to take advantage of that!